DaVinci will be open on Sunday, August 20 from 4:30 p.m. to 10:00 p.m. to help celebrate the full eclipse on Monday, August 21! Come join us! Did you hear? We have added some fall flair to our menu! Come check it out! Please come and join us inside or out on the patio. We look forward to sharing our Summer Menu with you! 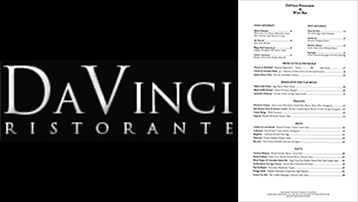 We are welcoming you to DaVinci Ristorante with a wonderful new fall menu. Please come in and give it a try!